A typical shepherding circuit map. The impetus for this originally came from a friend in Georgia, who asked for a webcam so she could get a new WGW sheep fix more often than once a month. After rejecting the idea of webcams dotting the landscape, I hit on the idea of becoming the webcam myself. That in turn catapulted me into the world of social media, which I’ve steadfastly ignored to this point. In fact, my iPhone is so old I couldn’t install any of the social media programs on it, so I have to take my iPad with me. Over the weeks it’s taken me to come up to speed with the technology, the idea has morphed into a way for me to keep a more dynamic record of each day’s grazing circuit than the hand-written versions I’ve been keeping in a beautiful notebook meant to inspire me to write each day’s note on the day. I can report that I’m currently about 4 months behind on the hand-written version. My beautiful grazing log book. So, although there is a bit of work in setting up and reporting on each day, it’s work I ought to be doing anyway. And, interestingly, the act of sharing my thoughts and plans, what goes well and what doesn’t, has made me more careful and deliberate in my thinking about what really most needs to happen for the sheep on a given day. Let me assure you, though, Come Shepherding is not replacing Yarns from the Farm—they will continue to come to you via email and on the same 4-6 week time frame. So, if you’re inclined to an up-close and personal interaction with me on shepherding days, try following whitegumwool on Twitter, Facebook and especially Instagram if you want the photos. I haven’t yet figured out how to glue the “follow me” buttons onto my website, so you’ll just have to find whitegumwool on those sites. I’m still better at getting sheep to follow me than social media programs. The flock following Horatio following me. He’s definitely emerging as the new leader. If the previous paragraph is complete Greek to you, do not despair. It would have been to me until recently. Start by just checking this link on Mondays, Wednesdays, Thursdays or Saturdays (Australia time—a day earlier for North America). Eventually, the other bits will start to make more sense. I’d go with figuring out Instagram first. Back in October, in Epiphany, I rashly claimed the sheep had learned pretty much all they needed to manage their individual nutrition well across the property. Subsequent upheaval in the flock’s social structure has more or less cancelled that claim. Losing charismatic, stubborn and highly intelligent Old Leader (HRH) was the first major blow, perhaps as much because her death was sudden, and there was no clear leader-in-waiting. Old Leader on the left, and Alice on the right. My two beautiful matriarchs. We all miss HRH. Alice is still going strong, though she’s lost both horns at different times in the race. Then in January I felt I had to sell half the flock to insure adequate nutrition for the remainder, and in the process lost a lot of experience, knowledge and talent I was not able to identify with specific animals. The result is a flock that simply isn’t working anywhere near as well as it was in October. Add to less effective flock leadership the ongoing dry cycle we’re caught in, and I was forced to rethink—recommit, really—to a new intensive shepherding routine, where I had become rather lazy and complacent last spring. One of the first things I did was to re-configure the way I manage grazing areas on the property. I’d been thinking about this since writing Epiphany, but it took the current pressure to get things to click in my brain. he photo tells it all: with the ongoing dry Swan Lake has almost completely dried up–just enough moisture left to trap this wether in the bog. Walking the plank was pretty exciting in my slippery, muddy boots. But I was able to pull him out, no harm except to his pride and my mud-spattered trousers. I’ve divided the property up into 3 main “grazing areas”, each encompassing several existing paddocks, principally with introduced grasses and clover. These are the Basin, White Gum and Racecourse Grazing Areas (see map below). Adjacent to the Grazing Areas are easily accessible biodiverse reserves where I can do part-day grazing circuits to improve the diversity level of forage. 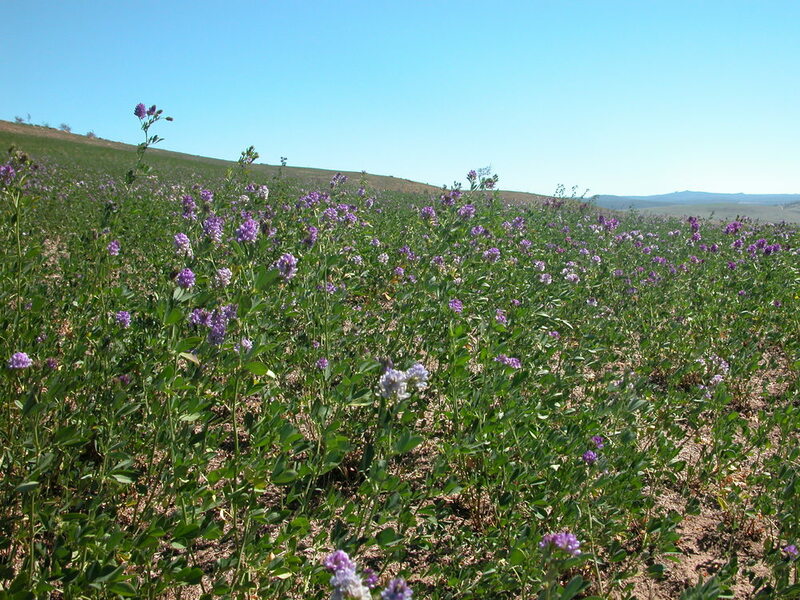 The large Lucerne Reserve, mainly a monoculture paddock of lucerne (alfalfa), can be reached from any of the Grazing Areas without traversing any other. Lucerne is high in protein and carbohydrates and its deep root system makes it drought-tolerant, so it’s a great resource to have. However, its monoculture nature makes it a poor place to leave sheep to graze for more than a couple of hours at a time. Getting the Lucerne Reserve central to all 3 grazing areas is pivotal to utilising it well. The lucerne at its best a few weeks ago. Since then, the aphids have been racing the sheep for who gets to eat it first. Aphids are winning, but the lucerne is coming back surprisingly well from the base of the plants. The other thing I’ve done with setting up the grazing areas the way I have is to run them as much as possible along contours. All else being equal, sheep preferentially graze uphill and upwind. Hence, a grazing area with a lot of slope will end up overgrazed at the top and undergrazed at the bottom. Undergrazed at the bottom of one of the Racecourse paddocks. A close up with my good camera in the rank patch, so you can see them tackling the long grass. Don’t let anyone tell you sheep will only eat where it’s short–that’s just a rationalisation for over-grazing! I’m now really happy with the overall configuration, and I’m confident by sticking to my shepherding plan of 3 half-days and 1 full day a week we’ll battle through to shearing in September without a break in the wool or any ill effects on the sheep. I’ve already made the tough decision not to lamb again this year (this will be the 3rd year in a row)—there is just not enough forage on the ground, and not enough growing season left to improve it to the point I’d be confident of raising lambs on it come spring—let alone be sure the pregnant ewes were getting enough nutrition over winter. This second deep dry cycle in less than 10 years has me questioning the real “carrying capacity” of this landscape, especially given my commitment to keeping my sheep for their natural lifetimes, if at all possible. I thought 1000 sheep, or roughly one to the acre, was a sustainable number, year in, year out. I’m thinking now the number is probably closer to 2 acres to the sheep. If I’m right, then the good news is rebuilding the flock just got easier. Ah, a couple of photos I promised you from Six Impossible Things: sheep running the jetting race. Very hard to get them in focus, so you’ll have to use your imagination.